There are two kinds of people: Those who in the bed making camp who make their beds religiously every morning, aaaand those who are ok with crumpled sheets. I’m in the former — a freshly made bed gets me off to a good, clean start in the morning. No judgments here! I haven’t always been a bed maker, but when I started seeing how pretty it looked each time I walk through my room… well it just makes my day a little brighter. This brings me to my 5 bed making hacks, which can hopefully come in handy for the bed-makers and non-makers alike! 1. Box spring. If you don’t have a bed skirt like my friend scored, and have one of those unsightly exposed box springs, simply use a crisp, white fitted sheet to cover it up. 2. Flat Sheet. When making your bed, make sure the printed side of your flat sheet is facing down (like in this Instagram photo.) Trust me, it’s so soft and soothing, and you’ll never go back! 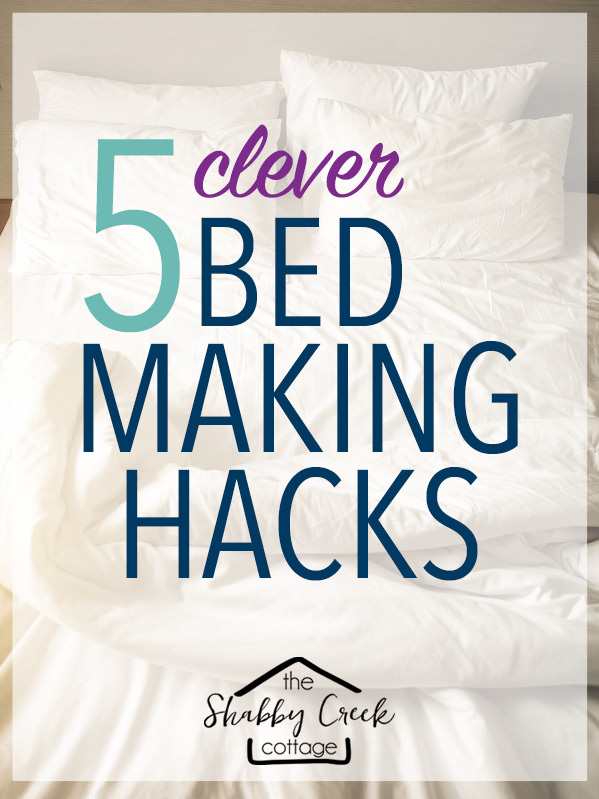 It’s one of those bed making hacks that seems so simple but makes such a big difference. 3. Pillowcases. If you have a lot of pillowcases to put on when you’re changing out bedding around your house, the whole awkward hold-the-pillow-under-your-chin thing can get old quick. Simply fold your pillow in half horizontally (so it’s long and thin), hold the sides together with one hand, and slip it into the case with the other. It’ll unfold on its own and settle in nicely. 4. Bedding. Buy the best quality bedding you can afford. Don’t skimp on comfort and style in this area of your home just to save a few bucks. Your bed should be a place you can truly rest and rejuvenate each evening. I buy most of my bedding from HomeGoods or TJ Maxx – it’s often cheaper than big box discount stores and much better quality. Want to shop online? The bedding above is from Wayfair for under $100. 5. Storage. 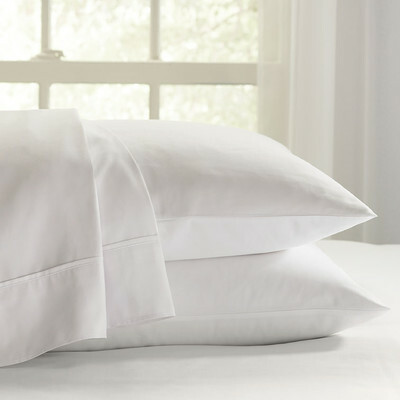 To help keep your linen closet or drawer organized, after you fold freshly laundered sheets, simply slip them into a corresponding pillowcase so it’s an easy-to-access packet when you’re ready to change the beds. And to avoid that musty storage smell, add a dryer sheet in with everything. I love the Marrakech set! I love the whole collection..Love the pillows the best. Eva Longoria Home Solana 4-pc. Comforter Set is the best in my opinion. My favorite is the Eva Longoria Home Solana 4-pc. Comforter Set & Accessories because I like purple tones. This would go perfectly in my bedroom. I will have to check it out the next time I go to JCPenney! My favorite from the collection is the Marrakech four piece Comforter set, love this style and print. I love the Adana collection. I also like the Eva Longoria Home Adana 4-pc. Comforter Set! I love the Solana collection! very subtle! I love the Mireless set especially the comforter – gray and yellow combo is my favorite. I love the pillows! And especially the Marrakech oblong pillow. I actually love that Marrakech set – it looks so clean and fresh and I could add some pops of color with pillows!! I love the 4 piece Solana. It would go perfectly with the grey walls in my bedroom! I love the Solana bedding design, and it’s such a light grey I can’t see it becoming overpowering or dark. I like the mireles best. I have to pick Marrakech, easy to add color to the rest of the room. I’m loving the Eva Longoria Home Adana Oblong Decorative Pillow and whole bedding set! My favorite is the Eva Longoria Home Adana 4 piece Comforter Set. I love the Adana Collection! I want to update my home to coastal décor and this blue and white pattern would be gorgeous in my bedroom. Thanks for the chance to win. The entire collection is simply scrumptious. I would be thrilled to use any of them in my bedroom which I’m just getting ready to redo, so I it would be so fun to work any of the collection into my decor. Thanks for the great hack tips–I am over age 65 and did not know these tips. The folding the pillow tip will really help me–I have lots of pillows to stuff. I really like the Eva Longoria black and white decorator pillow, it looks so nice and crisp. The Solana collected is so soft and soothing. I LOVE a well made bed and so happy with your rule #2. My mom raised me with that rule. I love the bedding! It is beautiful! I like the Mereles comforter set. I love the Marrakech Comforter Set.! I went to view the line and my favorite is the Eva Longoria Home Solana 4-pc. Comforter Set. I love the Marrakech collection. The Marraceck pattern gets my vote. I LOVE love love the Marrakech pattern! Eva Longoria Home Adana Euro Pillow is my favorite piece. I love the Eva Longoria Home Adana 4-pc. Comforter Set & Accessories. I love the color blue so my favorite is the Adana line. You gave great hints for making beds. I am going to try them and am making a commitment to make my bed more often!!! All her stuff is gorgeous. I love the collection with the yellows & greys, Mireless. But if I could afford to change out my bedding for every season! I really like the bold contrast of the Marrakech Comforter set. I really like the Eva Longoria Home Marrakech 4-pc. Comforter Set. Would be great to update our bedroom! I really like the Eva Longoria Home Adana 4-pc. Comforter Set. I love you he tip about putting everything in the pillow case. About to move in to our 1st house and this would be a great house warming gift. And just maybe I’ll start making the bed and come over off the dark side, lol. I love how beautiful it is in your bedroom! I love the Solana comforter set. So pretty. ADANA! The color and pattern are beautiful. I like the Adana 4 pc. comforter set. Thanks for chance to win. I could not make a decision. I loved 3 of them, and so I took a look at the Adana, the only one that was not one I was torn about, I ended up loving it. The Adana is beautiful. That is my pick. I would love to have it. The Eva Longoria Home Adana 2-Pack Curtain Panels would be very nice in my bedroom. I like the Eva Longoria Home Solana 4-pc. Comforter Set & Accessories. I love black and white so I love the Eva Longoria Home Marrakech 4-pc. Comforter Set. I like the Eva Longoria Home Mireles 4-pc. Comforter Set. Thank you!! Eva Longoria Home Mireles 4-pc. Comforter Set & Accessories is a really great bedding set. I like them all there all beautiful !!! But I really like the Eva Longoria Home Solana 4-pc. Comforter Set. I like the Eva Longoria Home Adana 4-pc. Comforter Set & Accessories the best. I like the Eva Longoria Home Adana 4-pc. Comforter Set . The Home Marrakech Valance would look wonderful with my new bedroom re-do I’ve been working on. Hadn’t picked anything out yet for the windows, but I love these from JCP. The Adana collection is perfect. I’ve got a plain comforter and color would be nice. I love the Eva Longoria Home Mireles 4-pc. Comforter Set, my bedroom really needs a makeover. I love the Solana set!! The Solana set is really cute! The Adana Euro Pillow is the bee’s knees! THE Eva Longoria Home Adana Valance IS A BEAUTY! THANKS FOR THE CHANCE! I would absolutely love to have the Eva Longoria Home Marrakech 4 piece comforter set. It would be perfect for my bedroom. The Eva LongoriaHome Solana Valance is my favorite piece. My favorite is the Eva Longoria Home Adana 4-pc. Comforter Set. I love the Eva Longoria Home Adana 4-pc. Comforter! I love the Eva Longoria Home Adana 4-pc. Comforter Set & Accessories. It would give my bedroom a whole new look. I love the Eva Longoria Home Solana 4-pc. Comforter Set! Bethany!! Love JCPenney bedding. I buy their Euro pillows for my bed! And their matelasse bedspreads. Mireles is my favorite (it matches the colors I have in my bedroom)!!! Thank you so much! I love the sheets in the pillow case suggestion, Why didn’t I think of that after all these years. Also the fold the pillow lengthwise ideas is great, too. Thanks Katy and I totally agree, I love a good hack!